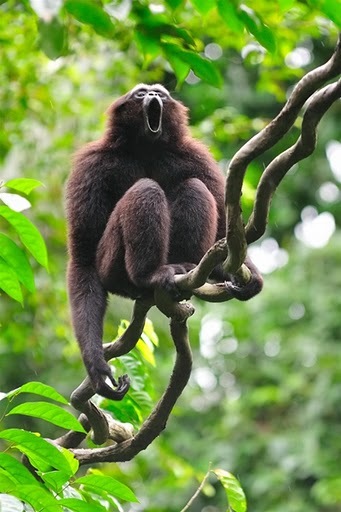 The Mueller’s gibbon (Hylobates muelleri) has rarely been studied, both in the wild and in captivity. The few studies that exist indicate that over the past 45 years, the population of this gibbon in the wild has decreased by about 50%. This has resulted in the species now considered endangered, with estimates of between 250,000 – 375,000 individuals remaining, a population which is experiencing significant decline. Muller’s Gibbon habitat is decreasing at an alarming rate as the forests of Borneo are rapidly disappearing. This is due mainly to the expansion of oil palm, rubber, and fast-growing tree plantations, and logging. Even in the habitats that remain, the gibbon’s survival is threatened by hunting for pet trade and for human consumption. PRCF plans to apply their ten years of experience in West Kalimantan to identify the conservation status of Mueller’s Gibbon in the Gunung Nyiut Nature Reserve, and to devise a plan to address conservation needs for the species at other forest locations where we work with local communities. We aim to work with the local villagers to protect the species in its natural habitat in West Kalimantan.